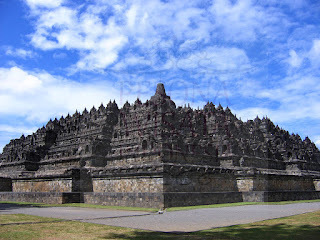 IndonesiaTravelVisit.com | Borobudur temple is the most magnificent Buddhist monument and the largest stupa complex in the world that is recognized by UNESCO. Borobudur Temple as a whole becomes a masterpiece gallery of stone carvers. Standing long before Angkor Wat in Cambodia and the great cathedrals in Europe, Borobudur Temple has stood gallantly in the land of Java. The building called by UNESCO as the most magnificent and the largest monument and stupa complex in the world is visited by pilgrims in the mid-ninth century until the beginning of the 11th century. Buddhist people who want to get enlightened were flocking from India, Cambodia, Tibet, and China. Not only magnificent and large, Borobudur Temple wall panels are filled with 2672 sculptured reliefs which if arranged in row, it will reach a length of 6 km! It is praised as the largest and the most complete Buddha reliefs ensemble in the world, unmatched in artistic value. Reliefs carved on the temple walls are divided into 4 main stories, they are Karnawibangga, Lalita Wistara, Jataka and Awadana, and Gandawyuda. Besides telling about the life journey of Buddha and his teachings, reliefs alos recorded the improvement of Javanese community that was superior and powerful, and it can be seen in 10 reliefs of existing ships. One of the ship reliefs was used as a model in making ship replica used to sail the cinnamon route from Java to the continent of Africa. Currently, the replica of the ship called Borobudur Ship was kept in the Museum Samudra Raksa. To follow the flow of the story carved on the walls of the temple, visitors must walk clockwise around the temple, known by the term of pradaksina. It is entering through the east entrance, walking clockwise to the position where the temple is always on the right side, until reaching the foot of the east stairs and stepping up to the next level. This is done repeatedly until all the levels passed and reached on the top of the temple shaping the main stupa. Arriving at the top, put your view in all directions, it will be seen a row of Menoreh Hill, Mount Sindoro, Mount Sumbing, Mount Merapi and Mount Merbabu standing up straight around the temple. Mountains and hills are as if guarding the existence of Borobudur Temple. Based on Kayumwungan inscription dated 26the May 824, Borobudur Temple was built by King Samaratungga between the 8th until 9th century, coincided with Pawon Temple and Mendut Temple. The building process lasted for 75 years under the leadership of an architect, Gunadarma. Although not familiar with computers and other sophisticated equipments, Gunadarma was able to apply the interlock system in constructing the temple. 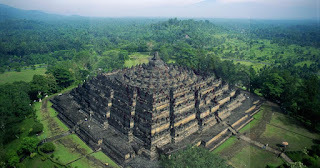 As many as 60,000 cubic meters of andesite stone which amount to 2 million stone blocks compiled from Elo River and Progo River, they were carved and assembled into giant puzzles that covered a small hill to from Borobudur Temple. Borobudur not only has a very high artistic value, a great work as the evidence of human civilization in the past is also loaded with philosophical values. Raises the concept of Mandala that symbolized the cosmology of the universe in Buddha teachings, this magnificent building is divided into three levels, namely the world of desire or lust (Kamadhatu), the world of form (Rupadhatu) and the world without any form (Arupadhatu). When viewed from the height, Borobudur Temple is like lotus petal on the hill. The wall of the temple which are in the Kamadhatu and Arupadhatu levels as the flower petals, while a row of circular stupa at Arupadhatu leves as the stamen. The main stupa represents the Buddha, so the whole Borobudur illustrates Buddha sitting on a lotus petal. Enjoying the splendor of Borobudur Temple is no enough just walking down the aisle and climbing into the top of the temple. One thing to look out for is to see Borobudur Sunrise and Borobudur Sunset over the temple. The splash of morning sunlight hitting the stupas and the statue of Buddha makes the grandeur and splendor of the temple being more felt. While standing on the top of the temple at twilight within a row of stupas and watching the sun slowly began to shade will create a calm and peaceful feeling. 0 Komentar untuk "BOROBUDUR TEMPLE , An Architectural Masterpiece of 9th Century"